CASI's Munk and Mitchell talk crop and soil management with Sustainable Cotton group in Mendota, CA, July 24, 2018! Veteran UC Cooperative Extension Advisor, Dan Munk, of Fresno County, leading discussion of mid-season cotton crop and water management, at the July 24th public field day at Pikalok Farms in Mendota, CA. CASI's Dan Munk, UC Advisor in Fresno County, and Jeff Mitchell, Cropping Systems Specialist out of the Department of Plant Sciences, UC Davis, shared knowledge and experience that they've developed over the years with a highly engaged and interactive group of cotton farmers on July 24th at a public field day hosted by Sustainable Cotton at Pikalok Farms in Mendota, CA. Gary and Mari Martin of Pikalok graciously hosted the educational event that turned out to be a quite-animated and instructive, frank exchange among all participants. Sustainable Cotton has been active in the San Joaquin Valley as a convener of information on alternative practices and approaches to cotton farming that use less chemical inputs. Munk provided a thorough discussion of important mid-season crop and water management topics and Mitchell challenged the group with respect to opportunities for using reduced disturbance and soil health techniques. The session was also part of the outreach and educational program of a California Department of Food and Agriculture Healthy Soils Program project, Securing the future of highly productive annual cropping systems in California, that involves monitoring sites at Pikalok Farms in Mendota and the longstanding NRI Project in Five Points. 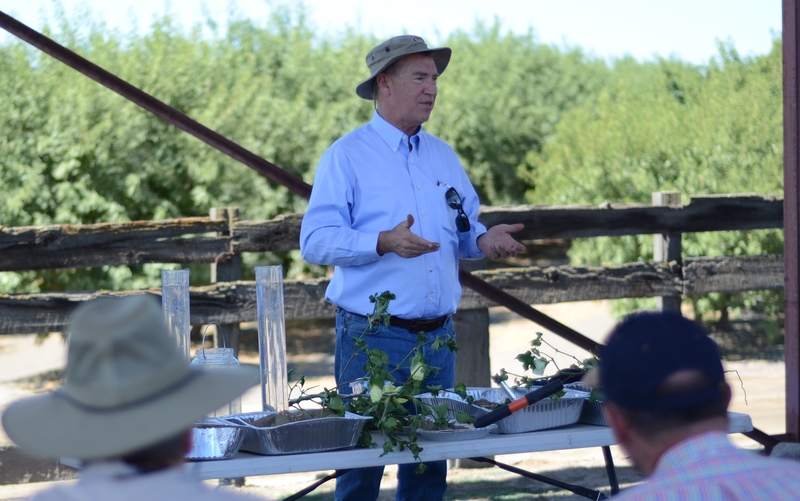 A follow-up summary of Mitchell's presentation and discussion on the under-valued importance of soil care in most annual cropping systems in California today will be posted at the CASI blog site during the coming days.